Emphysema is a chronic lung disease caused by damage to the alveoli, the tiny air sacs in the lung where the exchange of oxygen and carbon dioxide takes place. With emphysema, damage to the alveoli results in air becoming trapped, causing them to expand and rupture. Emphysema is classified as a type of chronic obstructive pulmonary disease (COPD), which also includes chronic bronchitis and bronchiectasis. As a result of the progressive damage to alveoli, people with emphysema will experience a decreased level of oxygen in the blood (hypoxemia) combined with an increased level of carbon dioxide in the blood (hypercapnia). Roughly five millions Americans are living with emphysema, the condition of which is associated with severe disability and a loss of as many as six life-years. COPD is today the fourth leading cause of death in the United States. In addition to respiratory symptoms, COPD can also lead to exercise intolerance and muscle atrophy. The combination of decreased exercise and chronic respiratory stress can promote lean muscle loss, especially in the core muscles. This can create a downward spiral where core muscle weakness only increases the severity of respiratory symptoms. Emphysema is characterized by what is known as COPD exacerbations. These are periods when symptoms become worse and require hospitalization. Exacerbations may be precipitated by infections or exposure to air pollution, wood smoke, or even perfume. People with emphysema are also at increased risk of developing lung cancer. According to research from Northwestern University Feinberg School of Medicine, COPD increases the risk of lung cancer by anywhere from 200 percent to 500 percent when compared to smokers without COPD. If your COPD symptoms are worsening, speak with your doctor about the possibility of lung cancer. Lung cancer is far more curable when diagnosed in the early stages of the disease. Smoking is the most common cause of emphysema, thought to be responsible for 85 percent to 90 percent of the cases. But there are many other causes which can act alone, or in conjunction with smoking, to cause emphysema. As many as 5 percent of people with COPD have a genetic disorder known as alpha-1-antitrypsin deficiency. The condition should be suspected when several family members develop emphysema, particularly if none have ever smoked. Medications: There are no drug treatments that have proven successful in slowing the rate of decline of lung function with emphysema. Instead, the medications are used to help increase exercise tolerance, reduce COPD exacerbations, and improve overall health status. 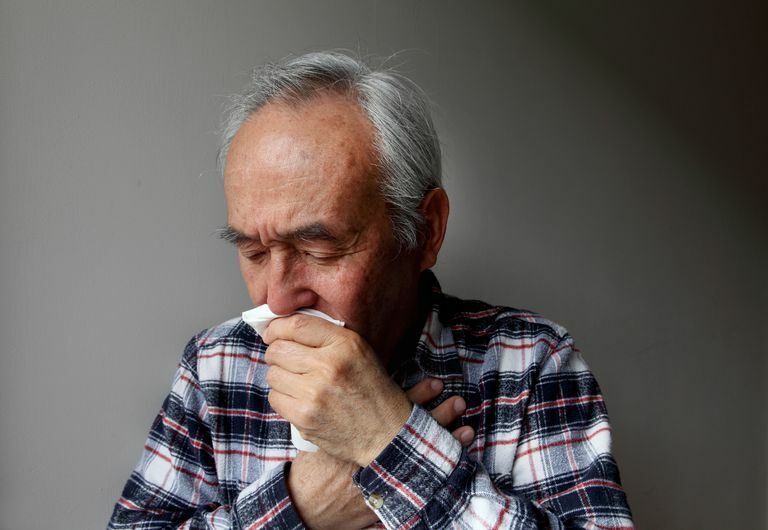 Medications used for stable COPD include bronchodilators, glucocorticoids, and antibiotics for infections. Oxygen therapy: This can be given continuously, during activity, or for the relief of sudden episodes of shortness of breath. Long-term oxygen therapy of over 15 hours per day is given when a patient has low oxygen saturation levels during advanced (stage IV) COPD. Quitting smoking: This is very important for individuals living with this condition and can help to slow the progression of the disease. Pulmonary rehabilitation: There are many benefits of pulmonary rehabilitation, an interdisciplinary program that should last at least six weeks. Pulmonary therapy can make a big difference for people living with emphysema by improving exercise tolerance, reducing symptoms, and decreasing hospitalizations and lengths of stay. Immunizations: Staying up to date with immunizations, especially the flu vaccine and the pneumonia vaccine, helps prevent infections which can result in worsening the disease. Regular exercise: Emphysema creates a vicious circle. The disease itself makes it difficult to exercise, and the atrophy of muscles can, in turn, make the disease worse. The best exercises for COPD include a combination of endurance, flexibility, and strength training. Lung surgery: Lung volume reduction surgery to remove severely damaged tissue may be useful for some people with severe emphysema, especially for those who have disease predominantly involving the upper lobes. Bullectomy may be done in patients who have giant bullae. Lung transplant is another consideration. Emphysema can be a frustrating disease all the way around. Not only do you have to cope with symptoms and treatments, but those symptoms and treatments can affect nearly every other area of your life. Many people with COPD receive inadequate support. At the current time, emphysema remains an irreversible disease and treatment is aimed at slowing the progression and complications related to the disease. Recent advances in stem and progenitor cells research offer hope that lung regeneration therapy may one day reverse this progression of the disease. Oh, D., Kim, Y., and Y. Oh. Lung Regeneration Therapy for Chronic Obstructive Pulmonary Disease. Tuberculosis and Respiratory Disease. 2017. 80(1):1-10. Raviv, S.; Hawkins, K.; DeCamp, M. et al. Lung Cancer in Chronic Obstructive Pulmonary Disease: Enhancing Surgical Options and Outcomes.Amer J Respir Crit Care Med. 2011;183(9). DOI: 10.1164/rccm.201008-1274CI. Rzadkiewicz M, Bratas O, Espnes G. What Else Should We Know About Experiencing COPD? A Narrative Review in Search of Patients’ Psychological Burden Alleviation. International Journal of Chronic Obstructive Pulmonary Disease. 2016. 11:1195-2304.
van Agteren J, Carson K, Tiong L, Smith B. Lung Volume Reduction Surgery for Diffuse Emphysema. Cochrane Database of Systematic Reviews. 2016 10: CD001001. What Are the Causes of Cheyne-Stokes Respirations?